Beverage Wholesaler - February 26, 2018 To view this email as a web page, click here. Whiskey is amidst a new golden age. American whiskey grew 6.4% in volume in 2017 to reach 23.2 million 9-liter cases. 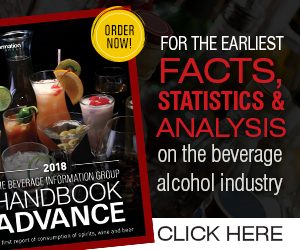 Bourbon's volume increased 6.7% last year to 20 million cases. Canadian and Irish remained on fire, as did most imported whiskies (save for Scotch's relative slowdown). Expect further growth in 2018 as more consumers discover and drink their way through this broad and red-hot category. But while the overall outlook for whiskey is fantastic in 2018, there are a few potential issues worth noting. Immense demand for brown spirits, coupled with the issue of slow cash flow at distilleries, has caused some suppliers to put out questionable product. In particular, there is an influx of young whiskeys bottled before they have time to fully mature. Overall these are unpleasantly tasting products, grainy and sharp, that nevertheless can come with considerable price tags. Craft rum is on the rise. Savvy consumers have discovered that the category offers the same depth of flavors as whiskey — at a fraction of the price. Below are four craft rum brands whose recent sales success earned them Growth Brands Awards from Beverage Dynamics magazine in 2017. A bill in Wisconsin backed by Governor Scott Walker and wholesalers would create the position of “alcohol czar,” with the power to toughen enforcement of state liquor laws.